If you haven’t already, click ‘LIKE’ on the WEATHER & CLIMATE THROUGH THE EYES OF MARK VOGAN FACEBOOK PAGE for regular ‘on-the-road’ updates on local, national and international weather. These updates are also fed to my Twitter account also!!! Keep up to speed with the latest important weather info! Core of heat now centered over London with high soaring to 26C today, Scotland still awaits heat after high clouds kept things cool. Spain enduring rain and wind! It was 21C (70F) or warmer across an area stretching from the north of Spain to the north of England with 26C reached in central London today! The entire Western half of Europe, north of southern France has seen stunning blue skies and a blazing April sun produce remarkable warmth foir this time of year. Both Paris and London should only be around 14 or 15C (upper 50s F) rather than the midsummer values we’re seeing. All thanks to a strong upper level ridge that will continue to nudge northwards, erasing the cloud and rain showers which are holding temperatures only in the 10 to 15C range. What’s interesting is, up here in Scotland, temperatures have been below 21C, it’s been somwhat cloudier and thats due to a frontal boundary drapped across the Highlands. Pressures are a lot lower here than south of the border and thus skies produce clouds more efficiently and therefore temperatures are cooler. However, after tomorrow which should see a good deal of sun and highs close to 20C for much of southern, central and the southern Highlands of Scotland, the ridge that’s been sweating the Midlands and South of England in recent days will lift north, forcing pressures across Scotland to also rise. The rising of air pressure across Scotland raises the temperature in the higher atmosphere way up there and the depth in which the air sinks, compresses and warms is greater as it decends to earth. This ‘sinking’ of air creates a challenge for the atmosphere in producing clouds and the less cloud to block the solar rays from penetrating the ground, means we’ll see warmer temperatures!! It appears likely that by Friday and Saturday highs have a good chance at climbing into the unusual April territory of between 22 to 24C (72-75F) across interior Dumfries and Galloway, the Borders, the entire Central Belt between Renfrewshire and Midlothian northwards across the central Highlands towards Inverness. Even the interior of the north Highlands (Sutherland and Caithness) we could see 21, even 22C. However, along the entire east coast of Scotland stretching from Duncansby Head in Caithness to Berwick Upon Tweed on the Scotland-England border, a chilly, brisk east wind will pull clouds and fog in off the North Sea and this may produce a 10C temperature contrast inside perhaps a 10 mile stretch from the coast to inland areas. We’re also seeing an unusual April situation more typical of a midsummer warm spell. Clouds and fog roll into inland areas by night as the land cools, then as the sun rises by morning they burn back to the coast as the land heats up. Sea breezes also kick in when temperatures warm into the 20s as pressures are higher offshore becoming increasingly lower over the heated land. Air flows from high pressure to lower pressure, therefore explaing the sea breeze process. 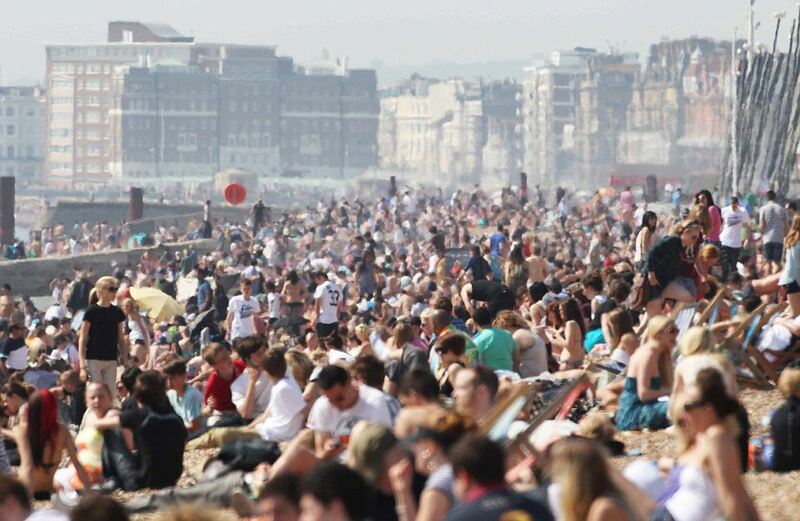 This ‘summer phenomenon will be in effect tomorrow and has been over recent days across southern England. These cooling sea breezes keep coastal areas some 10 to 15C lower than areas just a few miles inland, especially if areas just miles from the coast are protected by hills. This creates a greater contrast in temperature. While very warm, sunny weather spreads all the way to Scotland’s north coast this weekend, Scandinavia also warms dramatically! The graphics below are the Friday and Saturday 850mb geopotential heights. Note the darker yellows covering Britain in very warm air and the push of the ridge way up there past Iceland and off the northwest coast of Norway.. Take a glance at the graphic for today. Note the pale yellows covering all of Scotland today! Severe Weather as well as 8-12 inches of snow in Wisconsin grabs today’s headlines. If you didn’t think this spring could deliver any more dramatic of weather, then think again. 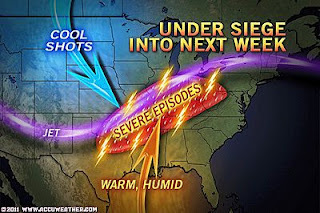 Most of the focus the past few weeks with these strong storms blasting west to east across the country has been the warm, humid side where powerhouse thunderstorms have formed and produced countless tornadoes. Well, with this very latest storm that is slicing a cold front through the Appalachains just now and heat to the east of the front surging northeast Maryland to 87 degrees, Philly 82 degrees and Atlantic City 83 degrees this afternoon, has also produced 9 to over 12 inches of snow across portions of Wisconsin. 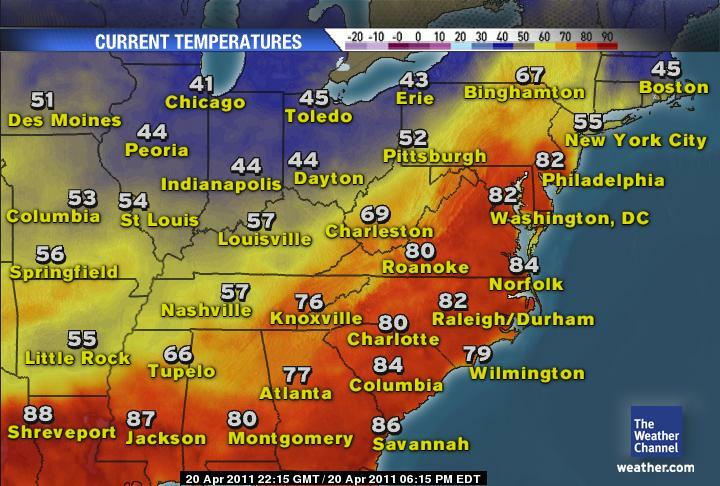 40s in Boston verses upper 80s in Maryland today! It was a warm, windy day throughout the Mid-Atlantic with many areas enjoying low to mid-80s with a strong southwest wind howlling in reaction to an approaching cold front that’s crossing the Appalachains and moving across the Coastal Plain this evening. The residual heat and humidity of the day combined with the energy associated with this front moving through the area from Raliegh, Richmond, DC and perhaps up into Philadelphia, may stark the odd thunderstorm and hefty rain shower. However, this front will loose power as it enters this area where the dynamics aren’t in place. 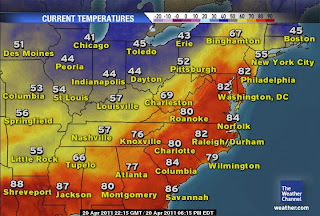 Notice the 45 in Boston, while NYC’s La Guardia is 55, Philly 82! There has been a huge temperature contrast between upper 80s seen across Virginia and all the way to the NE corner of Maryland. 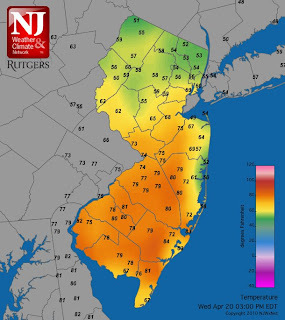 Low 80s from Philadelphia to Atlantic City and even 80s in Trenton. 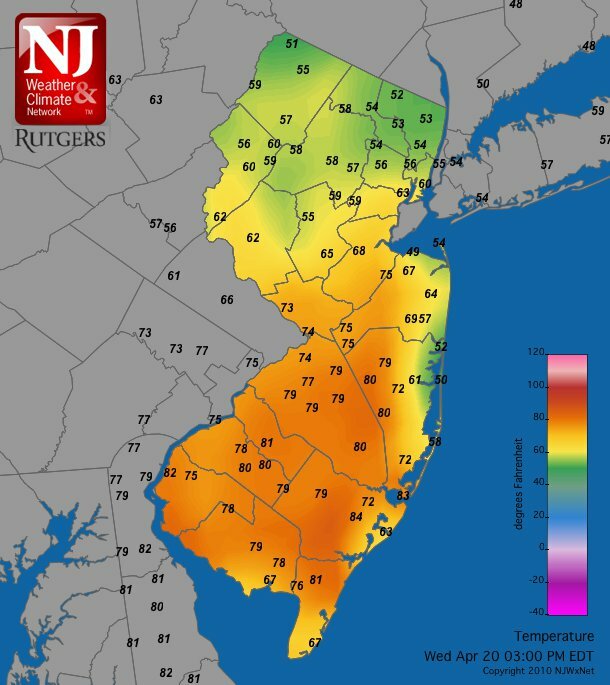 However, once you headed north, northeast from Trenton, temps fell through the 70s, 60s and even 50s around Greater New York City. Remember, it’s less than 100 miles between Trenton, New Jersey and New York and the difference at one point between the two was 80 verses upper 50s! To the west of Sandy Hook, NJ, there was a reading of only 49 degrees at the same time Atlantic City was reading 83 degrees. By day, under bright sunny skies, highs are climbing to beyond 21C in many areas and in some cases into the mid-20s C thanks to a warm air mass in place. It is by far an unusually warm air mass for only mid to late April, we’re seeing temperatures that are more suitable for June. With very dry ground covering much of Britain as well as much of western Europe it’s possible that this is the reason, in part, as well as other factors including La Nina, that we’re seeing a strong upper-level ridge of high pressure across Britain and sending temperatures to record or near record levels. My thinking is going along the lines of both the still relatively long spring nights (compared to very short nights of darkness in late June) and the fact that the ground is so dry which may be in fact drying out this air mass as it sits over Britain is aiding in rapid dropping off in temperature jus an hour or two after dark. During mid summer, nights are short with southern areas seeing 4-5 hours of complete darkness while northern areas may only see darkness for 2-3 at best. In fact, during clear summer night’s here in the central belt, when looking north, there is faint daylight, all night. It never gets completely dark! Between this dry air and the still 5-6 hours of darkness, we are seeing under these clear skies, temperatures plunging from highs of 23 to 25C in the south to 5 or 6C by 2 to 4am the next day. In the north, readings are falling from 18 to 20C down to 2-3C by around 3-4am the following morning. In summer we don’t see that amount of drop in temperature. Then again we don’t often see days as warm as they are and will be at this still very early stage in the year. There are a few things that are contributing to large temperature swings that are perhaps a little greater than what we’re use to seeing here in typically humid, moderate and often boring Britain, when it comes to the weather that is! WHAT’S ON TODAY’S WEATHERBELL BLOGS?